Featuring NAC, ALA, Silymarin from Milk Thistle, and Selenium. Everyday we are exposed to environment stressors to our body such as pollution, heavy metals, chemicals in the food we eat, etc. Healthy detoxification is essential for overall health and vitality. The liver is the body’s major detox metabolic organ. It processes, packages, stores, and ships out carbohydrates, fats, proteins, and micronutrients. It is responsible for the breakdown and elimination of alcohol, toxins, hormones, and medications, as well as for the synthesis of vital proteins, such as albumin, prealbumin, and clotting factors. It may be stated that the health of the body depends on the health of the liver. 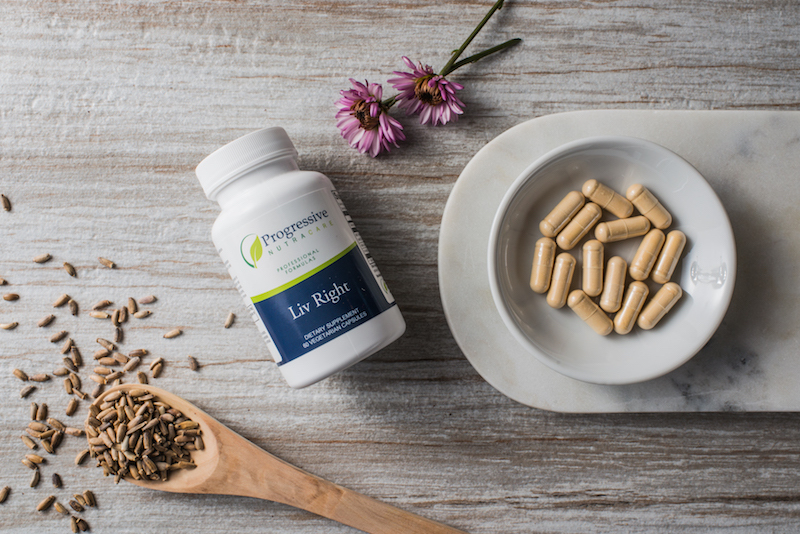 Research suggests that providing targeted nutrition supplementation may help support liver function and health. Liv Right contains the amino acid N-acetyl cysteine, a key component of glutathione-a tripeptide that plays a significant role in detoxification and antioxidant support. Liv Right also contains a combination of alpha-lipoic acid, silymarin from milk thistle, and selenium for support of antioxidant activity, regeneration of other antioxidants, and promotion of healthy immune function. Milk Thistle Seed Extract / Silymarin is critical as it has been shown to decrease and even reverse liver damage. It is a natural antioxidant and anti-inflammatory and is commonly used to detox the liver by helping to draw toxins out of the body. Milk thistle aids healthy digestive function by assisting enzyme formation, increasing bile production and soothing membranes throughout the body. In this formulation, milk thistle also assists with increasing glutathione production and assisting with antioxidant protection. Liv Right is a nutritional supplement intended to support detoxification and antioxidant activity in the body. Liv Right is for individuals with are entering into a detoxification protocol or those who have had exposure to environmental stressors such as heavy metals or pollution as well as someone with a chronic illness or infection. Liv Right can also prevent damage to or help to repair the liver. Liv Right is intended to take 1 capsules twice daily or as directed by your healthcare practitioners. Best results will come by combining Liv Right with a comprehensive detoxification protocol and a clean diet that includes high quality proteins, carbohydrates, fats and fiber. This combination provides micronutrients that further support active phases of detoxification as well as energy production, amino acid availability and elimination.